I could never get into Fallout 3 and didn't try Fallout New Vegas. Does FO3 pick up at all after the first few hours? The pacing was kind of killing it for me, which sucked because I love the original Fallout and Fallout 2, felt more like a Fallout Mod for an Elder Scrolls game. But I still own both on Steam, I think. Yes...once your mind gets comfortable with the way the game is, and missions start to pile up and fast travel points the game takes off big time. Between this and Witcher 3, I'm thinking of just getting a gaming PC now instead of waiting for the Oculus. I still only want to use a controller though. They already put out the requirements for proper Oculus usage. You can always just throw in a second graphics card if needs be down the line. And Witcher 3 works perfectly with the 360 controller. Just hook your PC into your TV and play away. But I don't think Fallout 4 will be out for a while. Hell if you use the Steam version of Witcher 3, you can just put it in Big Picture mode and essentially have a Steam console. Fallout 3 is one of my favorite games of all time, but New Vegas keeps losing my interest for some reason. The highlight of Fallout 3 for me isn't the main storyline, which is pretty thin, but rather the hundreds of little self contained stories scattered around the city. They are mostly built around sci-fi and horror tropes, and they are largely awesome. 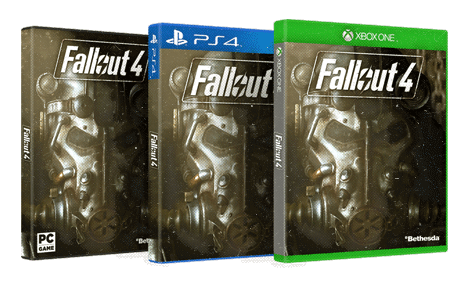 Looking forward to 4 and would love a F3/FNV re-release on PS4. They better not kill that dog. Fallout 3 takes a while to get going, but it's worth the effort. When it ramps up it's brilliant. New Vegas was good but I thought it lacked a little compared to Fallout 3. New Vegas's main story was WAY too short, but they made up for it with tons of side quests. I felt that Fallout 3 was the exact opposite, but both games are fantastic. One thing I noticed... I think ALL the footage was "in-engine" which tells me that they're MUCH further along with this game than anyone anticipated. I'm going to make a dumbass prediction now: They'll show off a ton of footage at their own E3 showcase, but MS will reveal "DLC comes to Xbox One first (and/or FREE)!" or something similar, just like all the COD games, and the game will be out THIS fall. Have to admit I was one that didn't play Fallout 3 but always wished I had. I wonder if they plan on doing a "upgraded version" for the current PS4 & X1? I just know that trailer looks cool as hell. I guess we don't yet if this is straight out SP or will have some MP and co-op in it? I sincerely hope they don't waste any effort on MP/co-op. There are many other games for that. Edit: Oh, Boston. That's actually what I was thinking based on the trailer. Is this by any chance a direct follow-up to Fallout 3 with the dog and New England setting, I wonder? It took me awhile to get in to Fallout 3, especially as someone that loved 1/2 and disliked the change to an FPS. I really should go back and play it, I enjoyed both it and New Vegas even if neither are as good as the originals. I have the original Games for Windows Live version of Fallout 3, makes me want to rebuy it on Steam just to have it there. Good looking trailer, hope the game is farther along then most announced games these days. This fall? Dan you crazy. A totally unreliable user on another forum dedicated to games said, "This game was in pre-production since 2008, and full production since 2011..."
If that's true, then it IS possible that this game is more ready than we think. Highly unlikely, but I didn't call it a 'dumbass prediction' for nothing. I hope this means they let Obsidian do Fallout: NCR or California or whatever. Have had New Vegas for years and it lingers on top of my pile of shame. I enjoyed the main story of Fallout 3 but I agree the real treat were all the little side stories and the feel of the world. Last edited by cruzness; 06-03-15 at 11:27 AM. I've yet to purchase an Xbone or PS4. This game is enough to prod me into finally buying one. That sounded a bit like Jon Hamm in the trailer. I am starting to lean towards thinking that this will be a November release. It would be a giant bomb for them to drop on us to tell us it is coming in just a few more months. Please make it happen!!!! Meh for me, sadly. Looks like more of Fallout 3, but with better graphics. And I LOVED Fallout 3. Will reserved judgement until more footage is released. I'm certain they aren't showing all their cards just yet.